Background Osteoporosis (OP) is a known complication in lung transplantation patients that may represent a worsening of quality of life and reduced lung capacity secondary to a fracture. Objectives Determine the prevalence of osteoporosis in a group of lung transplantation patients at our hospital, before and after surgery and the degree of bone mass loss after transplantation. 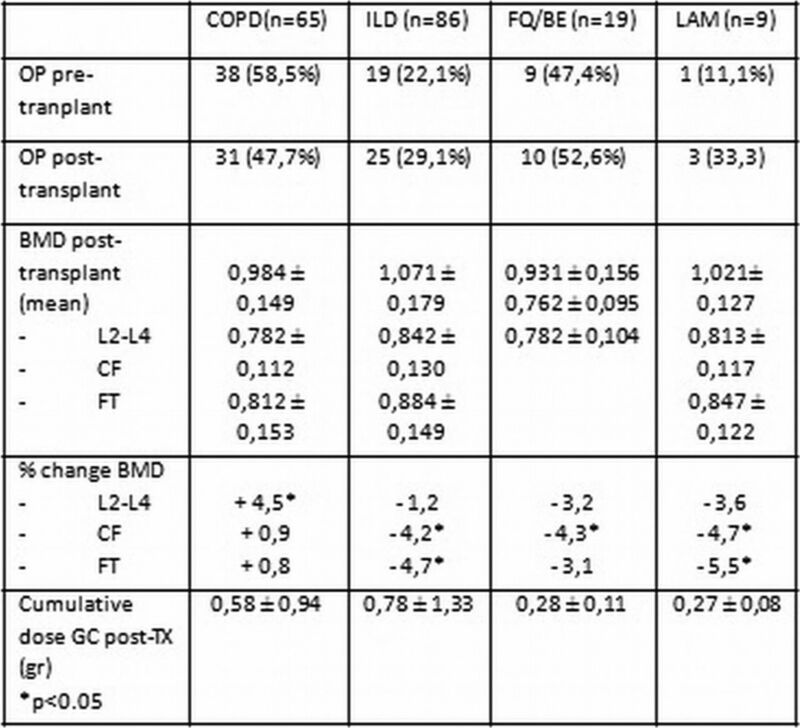 Methods 179 adults lung transplantation recipients between 1997 and 2014, that were evaluated for OP in Rheumatology Outpatient Clinic and who had available densitometry (BMD) lumbar and femoral (BMD) (Lunar Prodigy DXA System) prior and post transplantation were included. Demographics and risk factors for osteoporosis were collected. Patients were divided into 4 groups according to lung pathology. These were: COPD, diffuse interstitial disease (ILD), Cystic Fibrosis (CF)/Bronchiectasis (BE) and lymphangioleiomyomatosis (LAM). The dose of corticosteroids prior to transplantation was stratified in high cumulative doses (>5 mg/d for >3 months or >3 sets/year) or low if they did not meet these conditions. Post-transplant cumulative corticosteroid dose and the other immunosuppressive drugs were calculated from the transplant date to the BMD realization. The presence of post-transplant fractures was collected. For the assessment of change in BMD in each group, a comparison of pre and post-transplant BMD means was performed. Results 179 patients, 109 men (age 10.4±51.25) and 70 women (age 50.6±11.2), 65% postmenopausal, were included. 57% were smokers with a mean of 32.41±24.7 packs/year, 5% consumed alcohol, 28% exhibited osteopenia; 22 (12.3%) patients were underweight (BMI <19.99); 22.9% reported low calcium intake (<499 mg) and 101 (56.4%) required high doses of corticosteroids prior to transplantation. The prevalence of osteoporosis before transplantation was 37.4%; of these, 41 patients (61.2%) received treatment for osteoporosis. 17 patients had a previous fracture, 14 vertebral and 3 not vertebral. The distribution of patients according to disease was: 65 COPD patients (36.3%), ILD 86 (48%), FQ/BE 19 patients (10.6%) and 9 with LAM. The average time of the post-transplant BMD realization was 12.43 months (1-96). Evolutive results of BMD, the BMD change, the cumulative dose of corticosteroids and presence of fractures are shown in Table 1. Conclusions OP prevalence was 37.4% prior to transplantation and 38.5% posteriorly. A higher overall percentage of patients with pre and post-transplantation OP was evidenced in the COPD and CF/BE groups, probably due to the use of corticosteroids in COPD and the risk of osteopenia in CF. A loss of BMD at all localizations and in all the groups, some with statistical significance, was found except for the COPD group. The cumulative dose of corticosteroids after transplantation was higher in the ILD group followed by the COPD group. These differences could be explained by the greater number of patients in these groups and greater proportion of patients with acute rejection, entailing an increase of the cumulative dose of drug. More fractures occurred in the groups who received a higher cumulative dose of corticosteroids. Spira A, et al. Osteoporosis and Lung Transplantation. Chest 2000; Feb 117(2):476-81. Ferrari S.L, et al. Osteoporosis in patients undergoing lung transplantation. Eur Respir J 1996; 9:2378–2382.